Tesco has joined a chorus of businesses who say they will keep accepting the old £1 coin after they cease to be legal tender on Sunday. Britain's biggest supermarket confirmed the move after small firms called for a "short transition period" before the round pound disappears from the high street for good. The Federation of Small Businesses (FSB) has described the changeover to the new 12-sided coins as "fairly short" - amid fears that many shoppers will be caught out at tills across the country. An estimated 500 million round pounds are still in circulation, and some supermarket trolleys and rail ticket machines may not be ready in time for the switch. Tesco said: "We've been updating our systems ready for the new pound coins, but to help customers who still have the old coins, we'll continue to accept round pounds at our tills and self-service machines for an additional week." FSB national chairman Mike Cherry said: "Small businesses have embraced the new pound coin as an invaluable way to reduce counterfeits. "Many have modified coin-operated equipment while others have separated out millions of old coins to be melted down. "But the changeover period has been fairly short. While no business is obliged to accept the old coins beyond the deadline, it would help if small firms knew they were allowed a short transition period to collect the old coins if they wish to and are willing to bank them - but not give out to customers. Some retailers have said they will do just that - with Poundland confirming more than 850 of its stores will continue accepting old coins until 31 October. 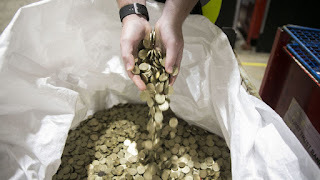 Banks and post offices will also accept deposits containing old £1 coins until further notice.